A classroom in FLSS was refurbished for teaching and learning music purposes to meet the demand of renovation on high school education. Under the theme “The sound of Autumn”, a musical festival was organized at FLSS (ULIS-VNU) to mark the establishment of a musical classroom and a musical training course in the School. Students are encouraged to register either musical instrument courses such as guitar, piano, violin, trumpet or basic and intermediate vocal music courses. According to the draft bill issued in January, 2018, music would be an optional subject in high school education. 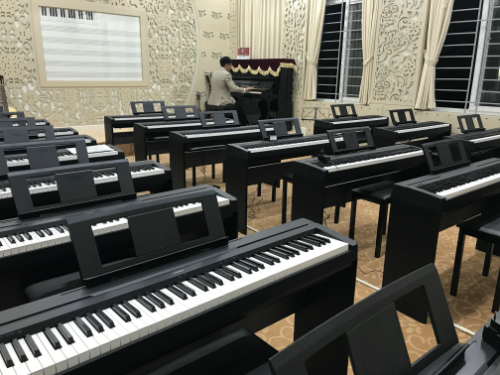 Therefore, the act of establishing the musical training programs in FLSS aims to meet that renovation as well as meet the commitment to a training standard of characteristics and abilities of the School’s students. President of FLSS, Assoc. Prof. Dr. Nguyen Thanh Van expressed his joy as the program had been officially launched for all students of the School. “The School has decided to establish this musical classroom on partly finacial support from parents in order to realize a modern musical trainning program. This is a present of love and care from the School and parents given to all students.” He says. What is the training standard of characteristics and abilities of the FLSS’s students? In 2017, FLSS issued the training standard of characteristics and abilities of the FLSS’s students, in which students are supposed to have 10 abilities, including: self-understanding, autonomy and self-study; communication, cooperation and leadership; problem-solving, activation and innovation; language; understanding of nature and society; technology; computer; art; fitness. 7 characteristics include patriotism, kindness, honesty, responsibility, dignity, studiousness, and discipline. Foreign Language Specialized School (FLSS) held a meeting with the parents of K50 student: Connection at present, strong steps into the future.